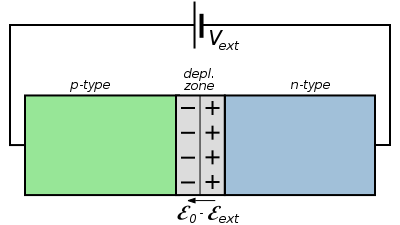 PN junction diode is symbolically represented as shown in picture. The direction of arrow is the direction of conventional current flow (under forward bias). Now lets try applying an external voltage to the pn junction diode. The process of applying an external voltage is called as “biasing”. There are two ways in which we can bias a pn junction diode. By using the above formula, we can calculate the tON for desired voltage we want from the total source voltage. By multiplying the duty cycle with 100, we can represent it in percentage. 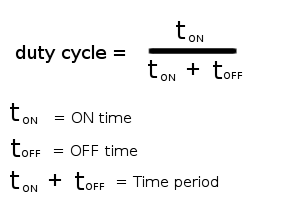 Thus the percentage of duty cycle is directly proportional to the amount of the voltage taken from the source. In the above example provided, if we want, 40 volts from a 50volts source, this can be accomplished by a step down chopper of duty cycle 80%. Since 80% of 50 is 40. The basic difference between a forward bias and reverse bias is in the direction of applying external voltage. 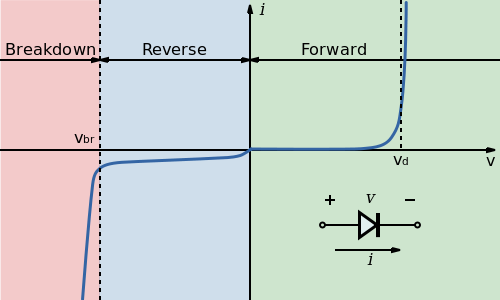 The direction of external voltage applied in reverse bias is opposite to that of external voltage applied in forward bias. Forward biasing a pn junction diode is very simple. You just need to take a battery whose values can be varied from (o to V volts), connect its positive terminal to the p-side of pn junction diode and then connect the negative terminal of battery to the n-side of the pn junction diode. If you have done upto this, the forward bias circuit of pn junction diode is complete. Now all we need to do is understand how the pn junction diode behaves when we increase the voltage levels from 0 to say 10 volts or 100 volts. We have learned that if we apply an external voltage higher than the barrier potential of pn junction diode, it will start conducting, which means it will start passing current through it. So how we are going to study the behavior of pn junction diode under forward biased condition? 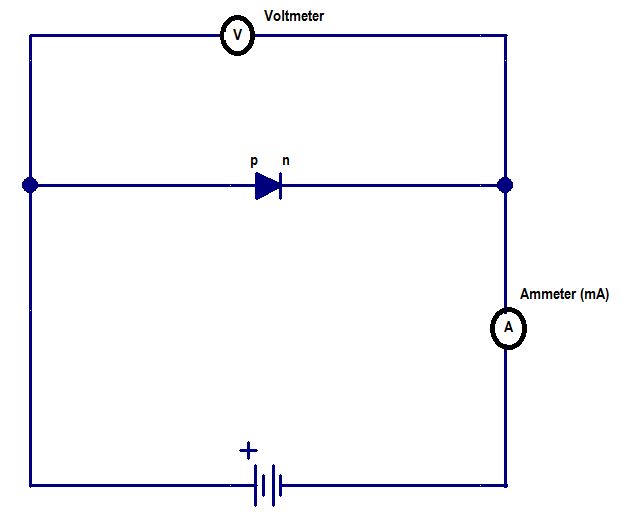 Lets get a voltmeter and ammeter and connect it to the forward biased circuit of pn junction diode.A simple circuit diagram is shown below, which has a pn junction diode, a battery (in picture it is not shown as variable. keep in mind we are talking about a variable power source), an ammeter (in milli ampere range) and a voltmeter. Why should we reverse bias a pn diode ? The reason is, we want to learn its characteristics under different circumstances. By reverse biasing, we mean, applying an external voltage which is opposite in direction to forward bias. So here we connect positive terminal of battery to n-side of the diode and negative terminal of the battery to p-side of the diode. This completes the reverse bias circuit for pn junction diode. Now to study its characteristics (change in current with applied voltage), we need to repeat all those steps again. Connect voltmeter, ammeter, vary the battery voltage, note the readings etc etc. Finally we will get a graph as shown.